Wow!! This is going to be great!! Thanks..
Me too, why couldn’t they make the video available to Canadians we’re neighbors and don’t the good lord say share with your neighbor. I can’t see it in Belgium, either! I am also Cdn. And have just watched the video… no problem. Perhaps you might try a different computer or some such. My sister and I were fortunate to receive an invitation to the event at the Mckittrick Hotel. You and Mr. Moore were so gracious and informative. It was a great pleasure to meet you! Your books have brought me such joy. You tell the most beautiful stories, taking a person to another place and time – just what most need in this day and age. Thank you so much for allowing us to meet you, take photographs with you and for the lovely gifts we received that day. I have no doubt that the tv series will be a huge success, but your books will always be ever so special to me. Ps – I was also born in 1952 – a good year! Just finished watching it and enjoyed every minute of it! I really do think that Mr. Moore and his crew will do a fantastic job with the series. Thank you! I always enjoy the twists in the plot, the people who pop up in unexpected places are always exciting and yet–so like real life–but most books don’t cover the span of time that yours do (and with enough detail) to make that possible. I also love the time travel aspect, but not just because of the physical possibility that you paint—but because I enjoy seeing the play between the time periods. For example, I love the adaptations (or not) that Claire (and later Brianna) had to make in order live in the 18th century without drawing too much attention to themselves; also what they missed (or didn’t) — like the sound of cars driving on a wet road. And I like the reverse when those back in the 1700s try to understand what things are like in the future; one of my fave scenes is when Jamie dreams of Jem and the telephone. Sometimes I find myself wondering what Jamie would think, how he would adapt– if he needed (and was able) to go to the future for which he is fighting. I’ll limit myself to those two, although I am tempted to go on. Thank-you and I look forward to the continuing adventure. WOW! I am SO excited for this new series! I’ve been a fan of your books since I picked one up on a plane (I used to be a flight attendant). I didn’t realize it was the third book in the series until I was halfway through, but once I found out I immediately went and got the first one, and have been a diehard fan ever since. My husband and I have cast the “Outlander” movie a million times over…. YAY OUTLANDER!!!! Waiting with bated breath! Och aye! Although disappointed that I couldn’t watch the video, I got a laugh out of the message displayed by YouTube when I tried: “The uploader has not made this video available in your country.” Why a laugh? I can’t watch the video because I AM an outlander. I see a Starz subscription in my future. Impressed by the care the team appear to be taking with the series, so while I initially assumed I would wait to watch on DVD or something, I now suspect I will sign up for Starz to get this when it comes out. I will also probably start the book series over again very soon – for the 3rd time. As to favorite things about your writing, I love the parts about medicine and Claire learning to treat conditions with 18th century technology and learning from herbalists and healers of the time. So great to think about how much indigenous knowledge we have discarded for “newer” things. Also, my Dad was a historian, and in any movie or historical site, I remember he would say “I wish they would show how they went to the bathroom.” So, I always think of him when you cover such ordinary details. Thanks! Thank you so much for sharing this video! The series looks to be in excellent hands and it’s wonderful that Ron Moore is taking so much care with all the details–hopefully it will be a long-term series. And what about Lord John? Will we meet him as a 16-year old so that their later meeting in Ardsmuir makes sense (or am I getting too far ahead in the tale)? Love you and all the books (can hardly wait for Dangerous Women), and I’m saving up to add Starz to my cable lineup next year LOL! Great job with the interview, Diana! I was wondering… how many minutes will each episode be? The world is a better place with you and your incredible gift to it. Many Thanks. I appreciate that your books covered so much history in so many places. I passed my college Brit History class based on the knowledge I gleaned from your books. I was never able to place history across the world in such a context that made sense, until I read the Outlander series. It was fascinating to think of provincial lords in their cold castles as occurring around the same time as French opulence and The New World’s beginning. I always tell people if they want to learn about history around the world all they have to do is pick up one of your books to span 3 continents and many more cultures and histories…. Fabulous!! I’m beyond excited about this series. The number of people I have gotten to read the books continues to increase. I think I share the same worries as anyone else who loves the books and seeing them become movies… the casting. Sam looks good as Jamie… but he’s shorter than I imagined… I know that shouldn’t hold me up. I am definitely going to watch the series regardless and I’m sure it’s just nerves giving way to doubt. I hope that it all comes out as amazing as I imagine. Thank you for the wonderful vision you possess and for passing on your gift to us all. Sam’s 6’3″–but Caitriona is (I think) about 5’10″, so the disparity of heights may not be what you were expecting. She’s a fabulous actress, though, and I think it will be a wonderful show! 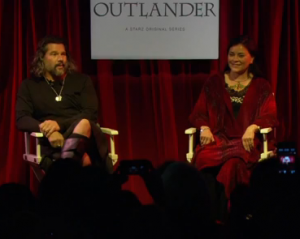 Diana Gabaldon is a wonderful and very innovative write. Oh but how she creates up these characters and spins the stories, exceedingly impressive! For example; in the Voyager she takes you from one tassel to the other you turn around there is something, always something! Fantastic, fantastic writer, her logic, very impressive! I glorify God as I read her books, for creating inventive and imaginative human beings such as she. I absolutely, absolutely enjoyed the series, from their beginnings to the last drops. I wish the TV series a great success, and hope they generate as much audience as the books. The excerpt of the shooting of the series in Scotland is quite appealing. Mr. Moore’s analysis lends it an air of impending success. Like many of Gabaldon’s fans out there, I too, await fervently for it to air. I was able to see the interview, but only with all the background noise, from another site. This is shaping up to be a fantastic series with Mr Moore at the helm and Diana as creator and consultant. The actors that are portraying all the characters, while not necessarily meshing with my imagination in looks, are actors after all and be they shorter, taller, blue eyed or whisky eyed will sweep us all back into the excitement of reading Outlander for the first time. I’m waiting for the casting of Fergus and looking forward to hearing Scots with a French accent. I live out in the boondocks, so won’t be able to get the series. I am hoping that it will be available on DVD soon after release! Do you know if the publishers are going to delay MOBY until the release of the series in August? The wait will be worth it, but I am hoping that they won’t be that cruel! Looking forward to seeing you in Surrey! I am so happy! I first read Outlander in 1997 and became a huge fan. I waited patiently for the rest of the series to come out the old fashion way with out internet. I had the unique opportunity to meet you a few years ago at the Scottish Highlander Games in Pleasanton, Ca. Now finding out Outlander is being made into a series is beyond belief! Congratulations to you! The clip has been uploaded to YouTube by Starz, so hopefully every can now see it. thank you Susan……just watched the clip. I can’t wait to see the series, I am sure it is going to be everything we expect. Not sure how we are going to be able to view it in Australia when it is released but I’m sure there will be a way. My husband mentioned he was thinking of downsizing the cable service. I told him as long as we still get STARZ, if not, I will divorce him. I use it all the time and it can be turned on and off. Easy to download and to use. I am reading the series for the 5th? time in anticapation of the next installment (I Hope!) Currently 1/2 way through Voyager and I have a question you’ve probably had before. How did Clair get her medicine box off the Porpoise?